The International Space Station will be extra visible toobservers on Earth this weekend ? sometimes up to five times a night ? thanksto some favorable sun angles that will light up the orbiting space lab. 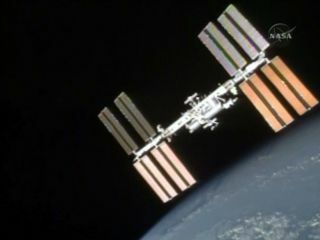 The space station flies about 220 miles (354 km) overhead,circling the globe once every 90 minutes. Usually, the station is invisible to skywatcherson Earth during some of those orbits because the sun isn't shining on it. However, over the next few days, the station's path will align with Earth'sday-night terminator, keeping the spacecraft in nearly constant sunlight, accordingto the website Spaceweather.com, which monitors spacecraft sightings and spaceweather. That means that every time it flies overhead, skywatchersgraced with clear skies should be able to spotthe space station as a moving star that can sometimes appear as bright asVenus. The rare solar line-up ends on Monday. The station is currently home to six astronauts ? threeAmericans and three Russians. Cosmonaut commander Alexander Skvortsov is leadingthe Expedition 24 mission. Construction on the hugespace station began in 1998 and it is now 98 percent complete. Fivedifferent space agencies and 16 countries have been working together to build the$100 billion space station, which is the largest human-made structure in space. There are several ways to find out when the InternationalSpace Station may be flying over your area. Information on when the spacecraftwill be visible over your city can be found at this NASA website. Each website will ask for your zip code or city name andrespond with a list of suggested spotting times. Predictions computed a fewdays ahead of time are usually accurate within a few minutes. However, they canchange due to the slow decay of the space station's orbit and periodic rebooststo higher altitudes. It is a good idea to check frequently for updates.